• Choose the service you require from the below price list. • Email me your HIGH QUALITY PHOTOS along with instructions on how you would like it printing. • Choose the size of image you require including how you would like it printed. • Once payment is received I will begin your painting or montage and send you a proof. • Only when you are completely happy with the proof will your piece of art be sent to you. • Your painting or montage should be with you within 14 days working days after your approval. • YOU CAN PURCHASE YOUR PAINTING AS A DIGITAL FILE AND PRINT IT YOURSELF. By sending your order you are automatically acknowledging that you are the copyright owner of the images sent to me, or have obtained permission from the copyright owner in written form, which permits me to paint and print it in accordance with your order. 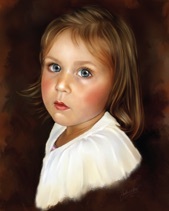 Prices are based on a head and shoulders painting of ONE person or pet on a simple background. If you would like TWO or more in the same painting or require a specific detailed background please add 25% to the below painting prices for each character. If multiple items are ordered at the same time they will be classed as 1 package and the appropriate postal charges will be applied. In all circumstances we aim to charge the lowest postage where possible. We try to be as Eco Friendly as possible and always recycle any packaging we receive, therefore some of the boxes/packaging may have been used before. Fine Art prints will be sent flat but will incur the higher courier cost due to size. By using the very best HahnemuhleTM papers with the leading 12 colour pigment ink printers we can ensure your 310gsm Fine Art prints are exactly that...Fine Art. Whether your image is Colour or Black & White, we custom profile our workflow to get the best colour matching possible. Your print will have a minimum 1/2” border to enable framing. 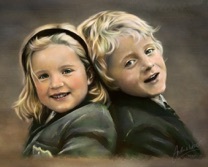 Your image is printed on ChromataTM white canvas using a 12 colour pigment ink Fine Art printer. The 420gsm canvas is wrapped around 45mm Gallery Stretcher Bars made from winter-cut, finger jointed and laminated Baltic pine. This gives the advantage of removing all knots and making the timber very strong and very straight, they are also FSC certified. All the frames have (EXCEPT ‘A’ SIZES AND 10”x8”) in the corners to allow you to re-tention your canvas to keep it tight. Supplied with fixings for hanging flush to the wall.